I can't stop playing with this penguin from the Snow Place Bundle! 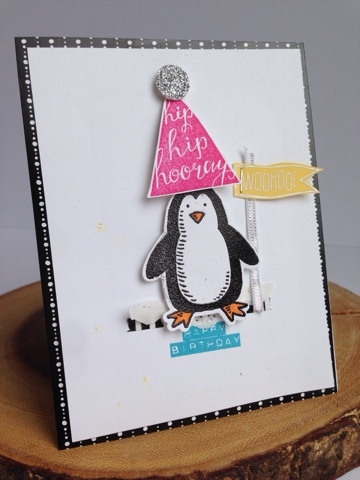 The hat comes from another favourite stamp set of mine called silhouettes and Scripts! I told you last week that you needed this... And I am hoping I gave you another reason why! This card was created for one of my favourite friends, Rhea. She is incredibly amazing and I am super blessed to have her as a friend. You can find her online at ReAson if you'd like to send her birthday wishes. 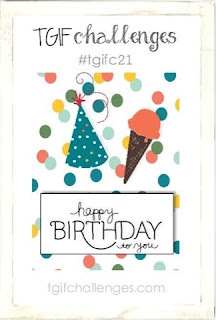 This week's challenge on the TGIF challenge blog is happy birthday. You have until the end of the week for us to see what you got. I am in New York City so if this post looks wonky, it's because I don't know what I am doing! So nice of you to drop by! Thank you! I loved my card of course. Have fun, enjoy and take a break, Cause Birthday visit this website starts today, I raise a glass and start to sing, For you – lets celebrate!